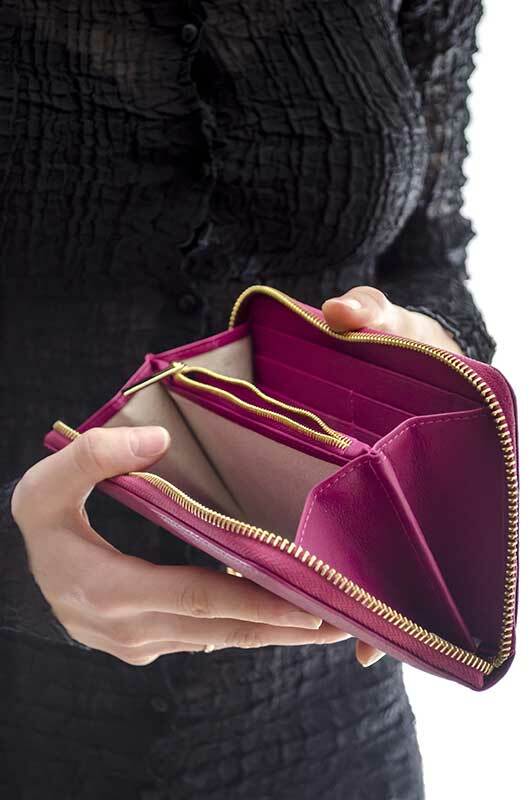 A wallet is sometimes the most ignored part of women’s accessories but no matter how classy your handbag is, having a trendy wallet is equally essential. Your wallets are not just going to hold your cards, currency or coins, they complement your fashion sense every time you take it out! We give you a list of must have women wallets from iconic fashion brands that have revolutionized the global fashion industry. Whether you are looking for a compact wallet that you can slide into your pocket or a one large enough to hold all your valuables, find the perfect one for you! Italian luxury brand Gucci has one of the widest ranges of women’s wallets that combine form and function in a stylish body. Zip around wallets are known for their utmost convenience. The pebbled leather body easily resists scratches making this a great option for everyday use. This comes with the collection’s signature chunky interlocking GG logo embossed on the front, and carries tassels on the zip slider. With a billfold compartment and card slots, this is a great wallet to carry your valuables. Fancy buying it? Find it here. A pretty and vibrant collection, the Prada Saffiano continental wallet comes in the liveliest of colours. Prada provides you with many options, leaving every fashionista pleased with plenty to choose from. Pick from the most popular saffiano leather collection which defines elegance in every element. The main compartment with a flap bears the brand name embellished in gold. The flap opens to a spacious compartmentalized inner pocket which features a zip pocket, billfold and plenty of card slots. The quilted leather version from Prada is also a great catch for those who are looking for a no-fail trendy wallet to suit every occasion. Buy this dapper piece of accessory today and instantly organize your cards and currency notes in style. If you are looking for a compact wallet that you can quickly grab and stash in your handbag, look no further. Known for its classy styling, Saint Laurent Paris has made a stunner which is a utilitarian piece that can hold all your essentials. The neat and flat design comes in textured leather that will never look worn out or old. Its slim form ensures that it will not take up too much space in your bag. This wallet is a simple choice that allows you to pair it with any outfit of choice. Buy one today and put your bills and cards in order! A practical design with unique styling and eye catching details, here is a wallet that you can carry elegantly with all your valuables secure. The full zipper opens to an accordion expandable, containing a main pocket that is divided into flat pockets. It also includes a zip pouch for coins, 3 bill fold pockets, and 12 card slots, so you don’t ever run out of room! For quickly stashing coins and accessing them instantly, there is also a smaller pouch on the front of the wallet. The zip sliders come with leather tassels. It also has contrasting metal hardware including stud embellishments and buckle details on the bottom corners and in the front. There is also a flap version for those who prefer it over the zip around closure which you can buy here. Another Zip around wallet from Bottega Veneta that made it to our list is the Intrecciato wallet. This timeless design offers maximum convenience, and does so with luxury and style. Bottega Veneta’s signature intrecciato pattern has a unique unmatchable charm to it. The zip opens to a wide main pocket with two flat sections and a zip pocket in between. It is one of the most spacious wallets you can find. The flat pockets are roomy enough to hold even a slim smartphone! You could make this your grab and go wallet for every occasion. Find a collection of these wallets in neutral colours at great prices here. Here is a stylish wallet from Valentino’s well renowned Rockstud collection. This wallet is more than just an accessory, it is also a style statement! It helps secure your valuables in a trendy body that is recognized by fashionistas worldwide! Made of fine leather in a variety of vibrant colours, the Rockstud collection of wallets come in zip around form as well as flap closure variants. The contrasting rockstud embellishments are the details that make this wallet stand out of a crowd. If you ever find the limited-edition variants like ones with bold animal print and pony hair up for grabs, do not miss your chance, as they are hard to come by! Take your pick from a range of Valentino Rockstud zip around wallets here. If you are looking for a one-of-a-kind wallet that exudes sophistication, there is nothing better than this python zip pouch from Celine. It is surprisingly well balanced in terms of style and practicality. The exotic python leather is the most distinguishing factor of this wallet. A subtle gold plaque with the brand name engraved on the front adds to the style. The zip opens to a flat spacious pouch that you could slip into your bag with ease. The interior pocket comes with leather lining, and the scratch withstanding outer leather ensures that the pouch will look just as good after countless wears. Buy one today and put forth the posh diva in you! That concludes our list of must-have wallets to grab now. Pick one which matches your outfits, personality and most importantly doesn’t compromise on functionality. Tell us which is your favourite in the comments section!